The 2008 NCOWS National Shoot is now history and I think we made some history. Being new to NCOWS, I don’t know what the Nationals were like in earlier times. The last three National Shoots have gotten better and better. 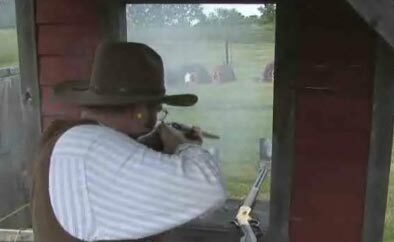 The 2006 National in Hooten Old Town, Kentucky, had around 43 shooters. The 2007 National in Hooten Old Town, had 63 shooters. This year at Evansville, Indiana, we had 63 registered shooters. However, last minute problems caused 2 shooters to drop out. We had shooters from 13 states represented at this years Days of the Outlaws . We had 17 new members join NCOWS through this shoot. We had Hamilton Dry Goods as a vendor at this years National Shoot and I saw a steady stream of cowboys and cowgirls leave his doors with smiles on their faces. If you are not acquainted with Ron Hamilton and his fine products, look him up on the web at www. Hamiltonsdrygoods.com. He has quality clothing at very reasonable prices. Homer Brown Leatherworks was set up with his Slim Jim holsters and other period belts and pouches. Homer is a leather craftsman and NCOWS member. Pat Proctor had her table set up with her hand made soaps and Bill videoed much of the shoot. If you are interested in getting a copy, let Bill know. Several of us made a trip to Whitaker’s Gun Shop in Kentucky and found a jewel of a gun shop. They have 4,000 guns in the store and is enough to make anyone drool. Lots of cowboy stuff too. French Jack donated a percussion pistol for the winner of the Pistoleer Class. Hope Jed Cooper enjoys his new pistol. We had door prizes from Homer Brown, Hamilton’s Dry Goods, Hodgdon Powder, Wild West Mercantile, Montana Vintage Arms, Starline Brass, CS Laminates, Midway, Eagle Grips, Whitaker’s, Brownell, Buffalo Arms, El Paso Saddlery, Cabela’s, Dixie Gun Works, Casino Astar, Jeff’s Blacksmith Shop, and TTN. Hopefully I haven’t left out anyone. The TTN shotgun was won by C.T. Phillips who told me that he had never won anything in all the years he has been at any kind of event. So to make it more special for Phillips we got a hold of The new customer promotion codes for casino players and gave him that too. This year was another first with the 45 COLT CHAMPIONSHIP. Powder Incorporated donated GOEX black powder ammo for the Blackpowder event and Black Hills donated the smokeless ammo. We had 3 mini stages set up for each type of powder. Using two pistols and shooting donated ammo we had a good time with this one too. There were 15 shooters in the Smokeless Shootist class and 17 in the Smokeless Duelist. Saturday, after the main match we had the 45 COLT CHAMPIONSHIP with black powder. We had 14 shooters who shot the donated GOEX black powder ammo. Both the smokeless and the GOEX were loaded up and not wimpy loads. These folks are supporting us and I hope that those of you who get the chance can help out these dealers. At the banquet, Saturday night we were entertained with poetry by Red River Fred. Some special certificates were presented as awards and I think really made the day for those worthy souls. These are some highlights of the 2008 NCOWS National Shoot, held at the West Side Sportsmen’s Club in Evansville, Indiana. Days of the Outlaws was very well received by the shooters, the host clubs, the general public who stopped by to see what all the fuss was about., and the club members who were interested in NCOWS. We were treated with the best of Southern hospitality even though we were north of the river. They have a great club and people at Evansville. Camping was available on the grounds for primitive camping as well as for those of us with tin tee-pees. For those who wanted more modern camping, there were two commercial campgrounds within 15 minutes of the shoot. For those looking for more comfort, there was the Holiday Inn Express not ten minutes away with shopping and numerous restaurants within walking distance. Most other motel chains were within 15 miles of the shoot. Words do not do justice to the way that we were welcomed and treated by the folks at Westside. I highly recommend this club as a host of other National Shoots and if you can’t make the shoot you will miss out on a truly great time. My personal thanks to all the folks at West Side and Red Brush. Lefty, you’ll do to ride the river with, pard. Duke Henry, Irv, Rob, Dave & Dave, Jim, all you others that made us feel so welcome.